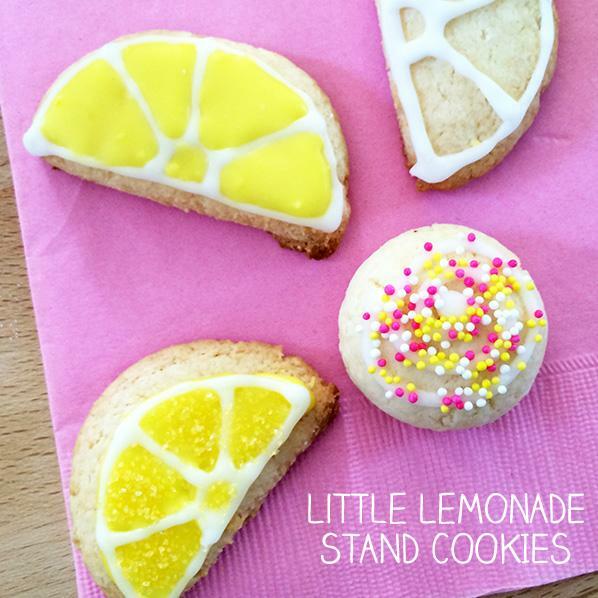 You guys are going to LOVE the Lemonade Stand Cookies my friend Jen from 100 Directions is sharing today! There is nothing more delicious and refreshing in the summer, than a Lemon dessert! She’s even got a free printable! So many fun things on her site! Summer is the season of lemonade stands! The kids love to host them, I think our neighborhood stand opened right after school on the last day of school! I love to see that entrepreneurial spirit thriving with the kids. It’s really neat to see them excited about creating something, showing it off and then realizing they can earn something from their hard work and creativity. So back to lemonade, what if we didn’t just offer that tasty summer drink? What if we also added some yummy cookies to the summer fun? 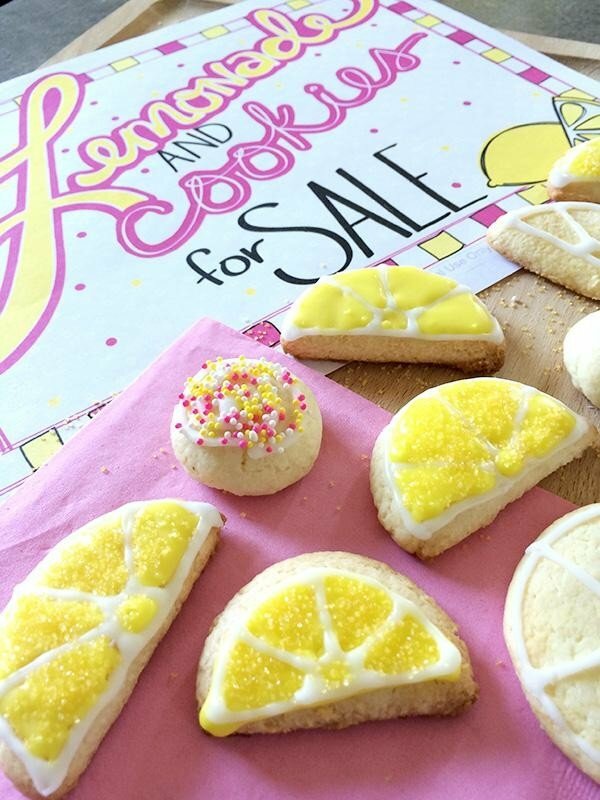 I think any excuse to include a cookie is worth investigating (and sampling) so today I have a super simple treat to add to the lemonade stand… Lemonade Stand Cookies! 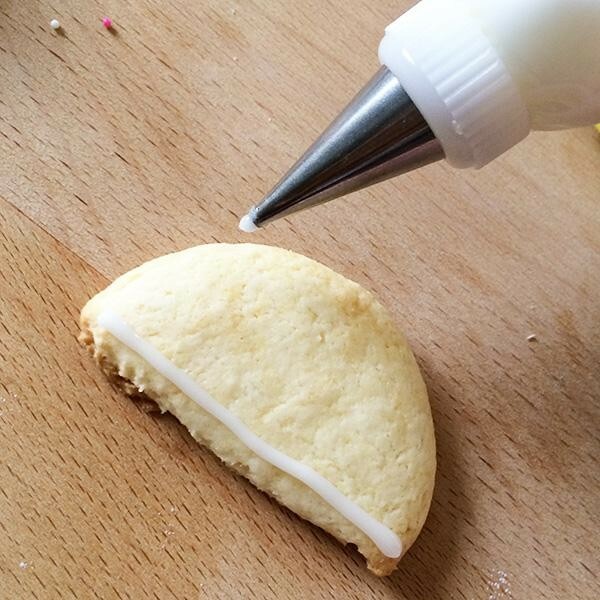 Note: This same idea will work with a standard sugar cookie too. 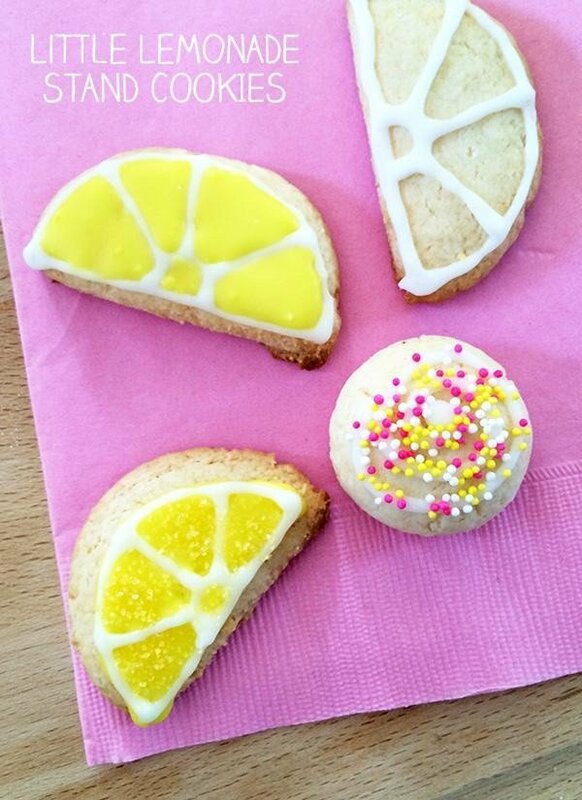 You can really go crazy and make these fancy schmancy cookies if you’d like, but I prefer quick and easy. After mixing up a batch of cake mix cookies, roll the dough into balls about 1” or so in diameter. Flatten each ball and then cut in half so you end up with a bunch of half circle pieces. Bake at 350 for 8 minutes then set aside to cool while you make your royal icing. Once the cookies have cooled, you’re ready to decorate. 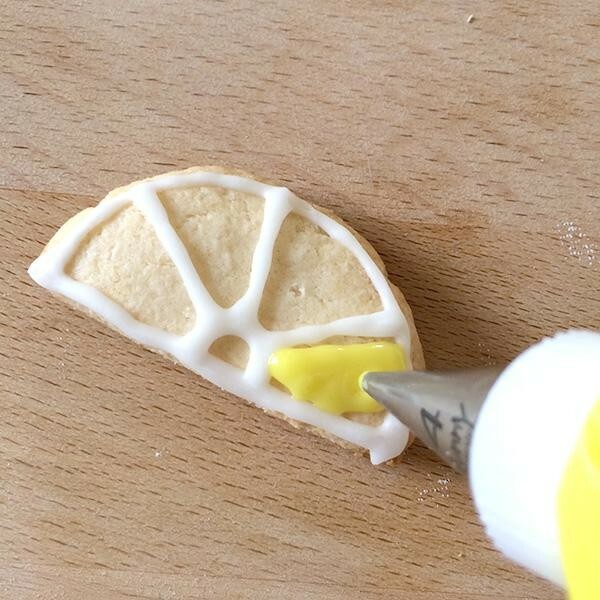 Start with the white icing and draw lines to look like the outline of a lemon slice. Set aside to “dry”. 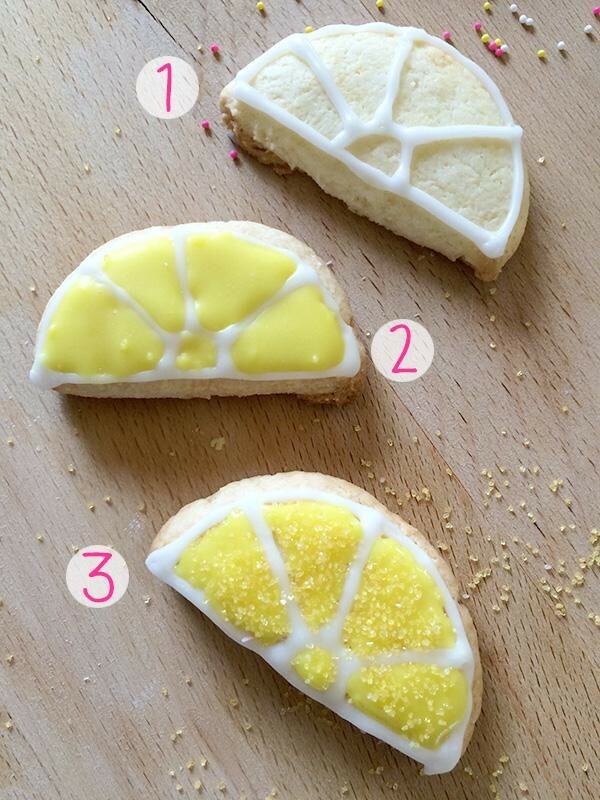 Fill each lemon piece with yellow icing and immediately sprinkle yellow sugar sprinkles on the wet icing. 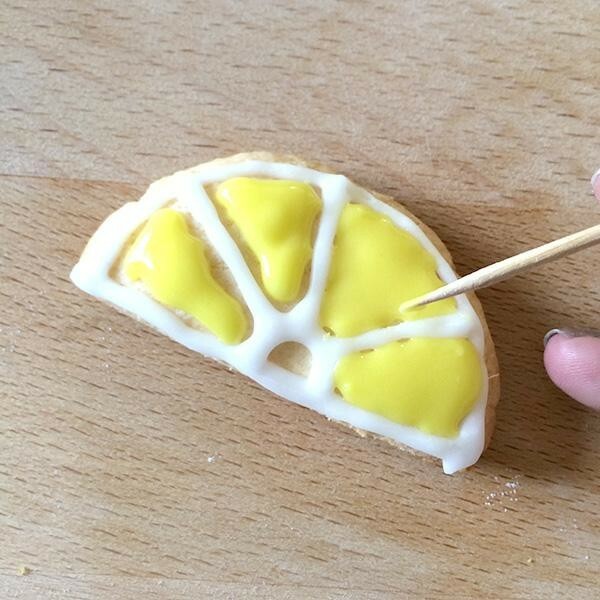 I played with some lemonade mix flavored cookies but they didn’t turn out as good as I imagined, so that will have to go back to the drawing board. Just for fun I did make some extra mini circle cookies. 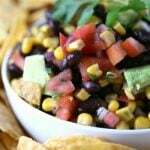 You can make them really quickly too. Make a little cookie dough ball, slightly press it down on the cookie sheet. Then add a swirl of icing and top with some yellow, pink and white tiny sprinkles. 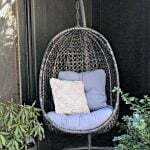 A BIG THANKS to Kim for having me over today to share this project with you, I hope you enjoy it! 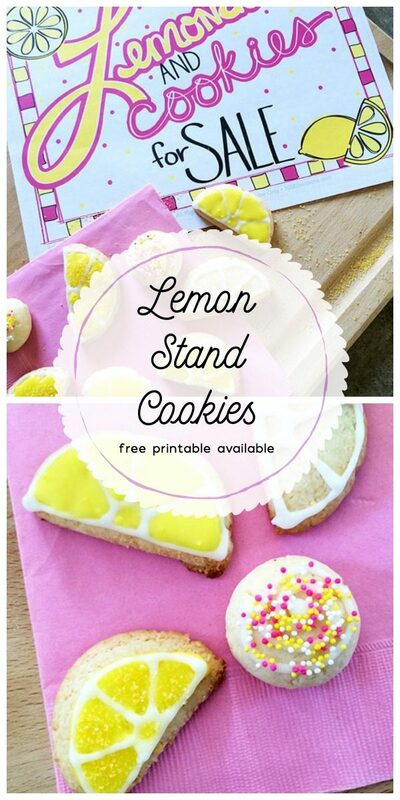 You can grab a full set of Lemonade Stand Printable decorations to show off your new yummy treats. I hope you have fun baking and creating this summer! Click here for your free Lemonade Stand Printable. Jerri, they are cute aren’t they? Sadly these weren’t my cookies, they were from Jen Goode a guest on my site.